A one-horned rhinoceros cools down in Bardiya National Park on October 4th, 2018. Thousands of tourists from around the world flock to Nepal&apos;s Chitwan National Park every year to get a glimpse of the greater one-horned rhinoceros. But for 46-year-old Nabin Adhikari, the animals are like colleagues. A wildlife guide for 16 years, Adhikari knows these rare animals and their habitat up close. "Just a few months ago, I saw two rhinos fight for two to three hours," he says at the beginning of an early morning tour. "Eventually, the brawl ended and one of the rhinos was dead." Adhikari says he reported the incident to the park&apos;s veterinary staff. The rhino whose death Adhikari witnessed was one of at least half a dozen to die of non-human-related causes in the park in the first nine months of 2018. And its death appears to represent a growing trend in the park. Between 2004 and 2014, a total of 81 rhinos died from unknown or natural causes—an average of around seven per year. That number has since shot up: From 2015 to 2017, 60 such deaths were recorded, an average of 20 per year. "Whenever we get a call reporting a death, we have a feeling that it must be a greater one-horned rhino," says one park staffer. Nepali conservation authorities, who have been lauded for winning the war against poaching and shoring up the country&apos;s rhino population to unprecedented numbers, are now worried that threats to the species persist. Now it&apos;s these "unexplained" or "natural deaths" that are raising alarm. The spike in such deaths since 2014 is being taken seriously by the Department of National Parks and Wildlife Conservation, which recently formed a committee to prepare a report on the issue. Guides like Adhikari keep a keen eye on the rhinos—their livelihood depends on knowing where tourists are most likely to spot the animals they pay to come and see. "For me, the reason rhinos are dying is that they are fighting among themselves more often," Adhikari says. "But if you want to understand the rhinos, you need to look at the Rapti." Snaking from east to west along Chitwan&apos;s northern border, the Rapti River is a lifeline for the rhinos, which spend much of their lives immersed in water or grazing on aquatic plants. Driving through the Kumroj Community Forest buffer zone in the park&apos;s east, Adhikari gestures into the distance. "Those are the waterholes where we&apos;d see rhinos wallow for up to 16 hours in summer," he says. "But now, you neither see the waterholes, nor the rhinos." Adhikari&apos;s observations are backed by science: The river is changing. Mammologist Shant Raj Jnawali points to a number of factors: increasing human settlement in the headwaters of the river has led to land degradation and more silt in the water. This sediment has reshaped the riverbed and buried waterholes previously used by rhinos. The construction of dikes along the eastern part of the park has also altered the river&apos;s flow. Rhinos are feeling the impact. Last year&apos;s monsoon flood caused unprecedented property loss and animal casualties. 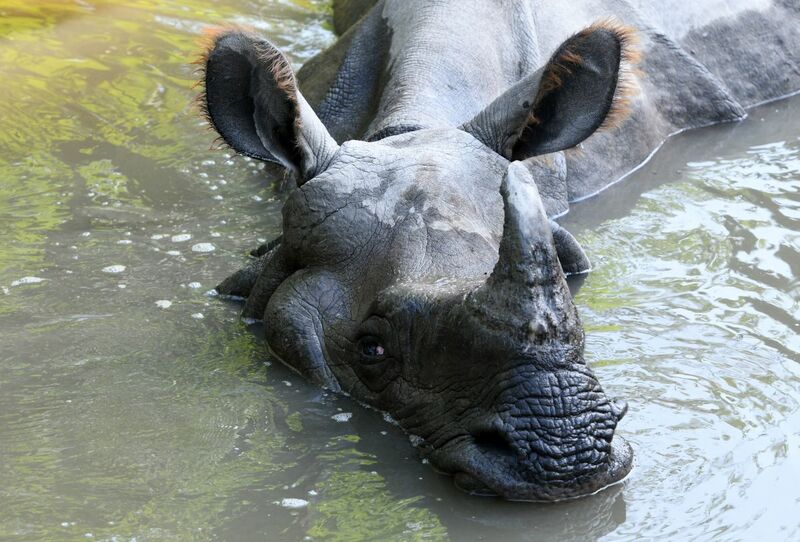 The river inundated the eastern part of the park and at least 15 rhinos were swept away to India. One was found dead in the western sector. Many more were injured. "That was the effect of the flood that was visible immediately. But there are other things that were not so obvious," says Ram Kumar Aryal, head of the Biodiversity Conservation Centre at Nepal&apos;s National Trust for Nature Conservation. 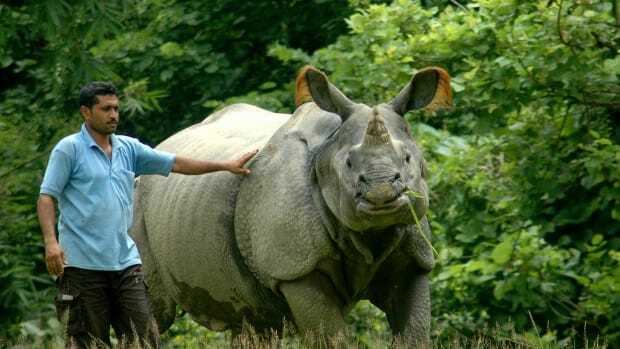 Aryal, who has been involved in Nepal&apos;s rhino conservation program since its inception, says the flood may have pushed the rhino population downstream, into the park&apos;s western sector. 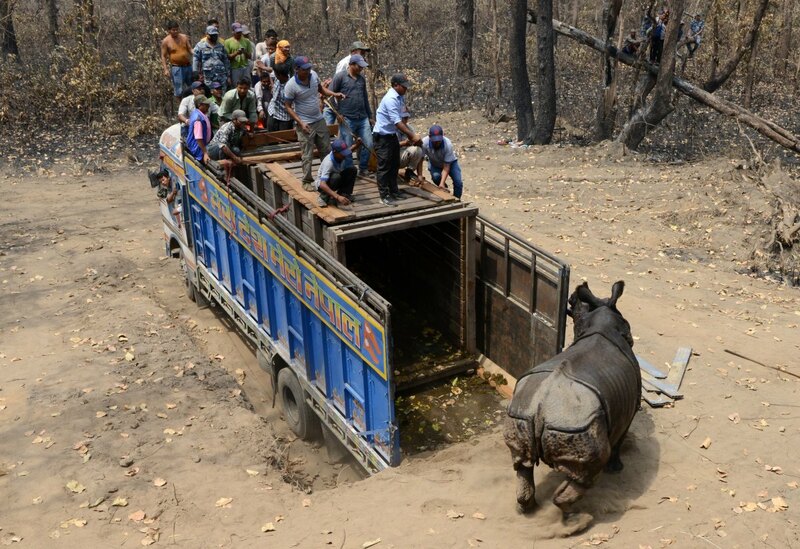 This photo taken on April 4th, 2017, shows a Nepalese veterinary and technical team releasing a rhino after it was relocated to Shuklaphanta National Park. Jnawali and Aryal suspect that, as the density of rhinos has increased in the park&apos;s western sector, the rhinos living there face increasingly fierce competition over the area&apos;s finite natural resources. Observations from guide Adhikari and Kumroj Community Forest chairman Hira Bahadur Gurung support this. "We have seen rhinos fight to occupy a water hole. We have seen them fight over mating. The male rhino kills even the calf of a female who does not give in," Adhikari says. "It is now hard to spot rhinos in the eastern sector," Gurung adds. Narendra Man Babu Pradhan, former warden of Chitwan National Park, questions whether increased competition is really leading to more rhino deaths. "We might be seeing more mortality cases in the west because the population is concentrated there. We cannot expect rhinos to die in areas where they do not live," he says. Are Rhino &apos;Baby Boomers&apos; Dying Off? Another hypothesis about the deaths suggests that we are currently seeing a natural die-off of rhino Baby Boomers. In the late 1960s, the rhino population in Chitwan dropped to a low of around 100. In response, Nepal&apos;s government ramped up efforts to protect the species, even deploying the army to protect rhinos from poachers. 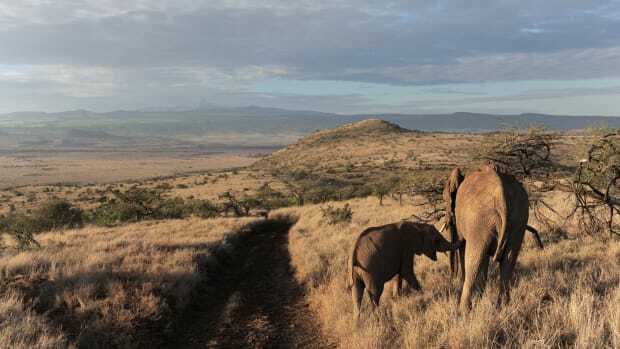 The results were soon visible as better conditions led to a massive upturn in the population—rhinos were more likely to live long enough to give birth, and those offspring were in turn more likely to survive and multiply. Researchers compare the rapid population increase to the "baby boom" in post-World War II United States. "It&apos;s been around 45 years since the government implemented strict conservation measures to protect the rhinos," Aryal says. Nepali zookeepers have observed that the species have a lifespan of 45 years. "So, maybe rhinos who were born during the spike are now dying. That could explain the recent spate of deaths," he says. Brook Milligan, a professor of biology at New Mexico State University, has a similar hunch. "This cohort of rhinos could be called the Baby Boomers," he says. An unusually large cohort of human babies naturally results in a corresponding uptick in death rates as the end of the natural lifespan arrives. "The same could well be true for rhinos," he adds. Jnawali, however, questions whether we are truly seeing the end of the natural lifespan of Chitwan&apos;s Baby Boomers. 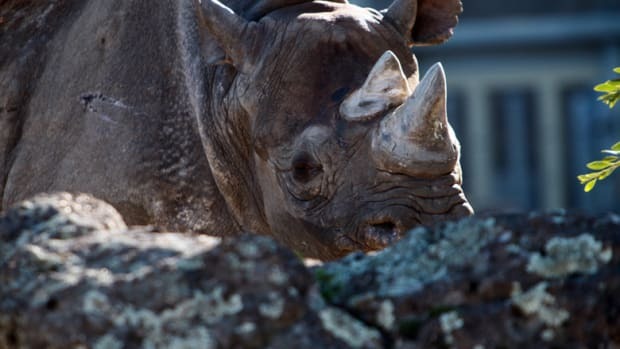 Rhino life expectancy in the wild has not been sufficiently studied, he says. 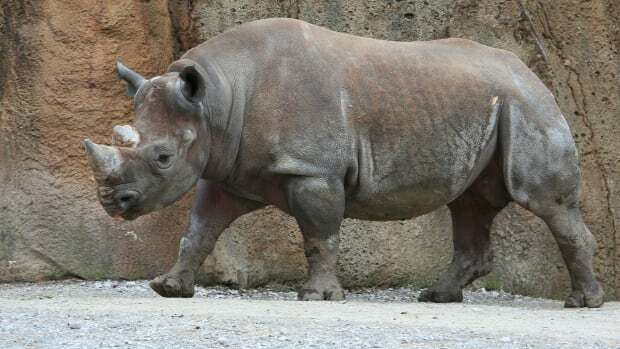 "In the years I have worked with rhinos, I have seen that they live only for 15 to 20 years and that is why the Baby Boomer hypothesis may not be true." 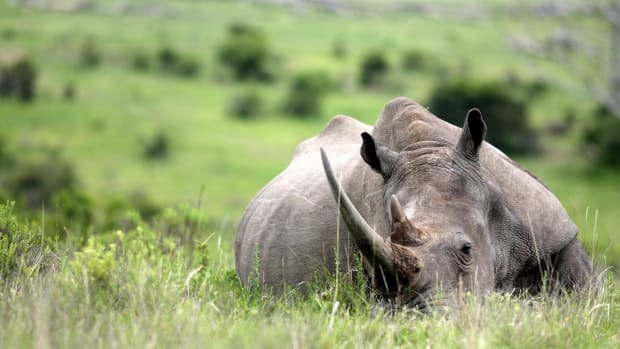 He suggests an alternative theory: As fewer rhinos are killed by poachers, more simply die of old age or other natural causes. 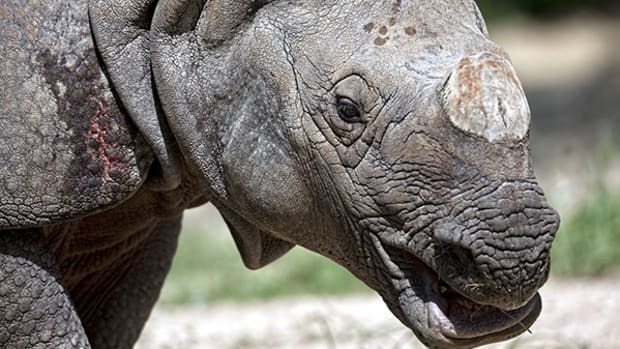 In past, he says, poachers targeted adult rhinos and removed them from the population—horns are sold by weight, and older rhinos have larger horns. As poaching numbers decline, he says he expects to see a natural uptick in deaths in the "natural causes" column. It&apos;s late afternoon, and veterinarian Amir Sadaula and his team receive another call. "A rhino was found dead near Meghauli, in the western part of the park," Sadaula says over the phone. "Sometimes we get to the incident site within hours. But there are times when we get there weeks after a rhino has died. When the team arrives at the incident site quickly, it&apos;s relatively easy to determine the cause of death." "Normally, when we see a dead rhino, we immediately see what killed it," says veterinary technician Purushottam Pandey. Sometimes, for example, rhinos get stuck in swamps and die there. "We have also seen situations when a mother fails to deliver her baby and either one or both of them die," says Pandey, who has also seen rhinos electrocuted on fences. All such non-poaching deaths would be counted as natural. Long delays, however, make autopsies more complicated. "If we get to the site late, it is hard for us to pinpoint the cause of death. That is why so many deaths have been categorized as &apos;unknown cause,&apos;" Pandey says. It&apos;s even harder to identify death cause of death when weather conditions are poor. "During the monsoon, which lasts over three months, it&apos;s not easy for wildlife guides or park officials to visit areas where rhinos live," Jnawali says. In fact, deaths that take place during this period may not get counted at all. While these deaths are a matter of concern for all stakeholders, they also present an opportunity, says Pradhan, the former Chitwan warden. "During the early years of conservation, we focused on the numbers. We saved as many rhinos as we could. But now we need to move past that and adopt a more scientific approach of habitat management that takes the carrying capacity of the park into account." Abhaya Raj Joshi is a journalist based in Kathmandu, Nepal. In 2005, conservationists launched a plan to establish rhino populations in seven parks in Assam state. It proved to be an even bigger challenge than expected.